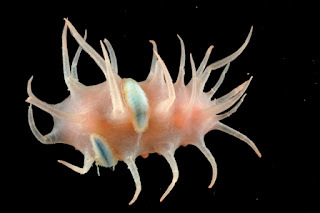 The Echinoblog: Plumbing the Depths of Guts in Deep-Sea Sea Cucumbers! Plumbing the Depths of Guts in Deep-Sea Sea Cucumbers! 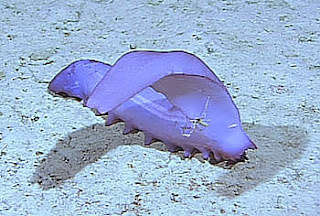 Deep-sea sea cucumbers (including sea pigs!) are weird, funky animals. And yet for all of their bizarre appearance their fundamental appearance seems remarkably simple.. When biologists started seeing these bizarre animals-they also realized just how MANY of them seem to be present in any one spot. Sometimes numbering in the 100s in quite a small area! And so naturally a LOT of important questions began popping up. What are they eating exactly? Is digestion part of what makes eating scum so good? What down there is so dang nutritious-that it supports a kajillion deep sea cukes?? How can a place that seems wholly depauperate of plants, life and light be supporting SO MANY animals? In addition to all of this, awhile back, I happened to get a classic question relating to sea pig biology- "Can I have one as a pet???" And the answer was "No." for various reasons. (click here to see that post). Data for this paper comes from two sources: A paper by Jody Deming and Rita Colwell (University of Maryland, 1982-go here to see it) and another by Teresa Amaro and others in Deep-Sea Research from 2009 (here to see it). 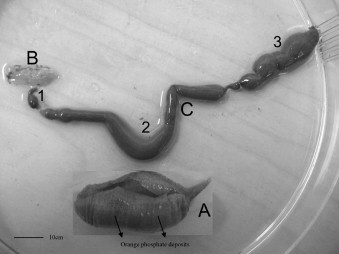 Fig.2 from Amaro et al. It turns out that microbes..specifically bacteria WERE present in the intestinal lining of these sea cucumbers! And in significant abundance!! Here's what they looked like.. These microbial floras were 1.5 to THREE times higher in sediments that had been recently ingested than those where present in the surrounding sediments. The abundance of these microbes was HIGHEST in the hindgut..where digestion in the intestine occurs (again the equivalent of our long intestine). Food? They did not rule out the possibility that the bacteria were somehow directly involved in providing nutrients via the gut to the sea cucumbers.. perhaps as food? or perhaps contributing to the minerals or the energy of the sediment being digested?? So-food would likely have a lot of problems metabolizing in these beasts at the surface..assuming they could get the right kind of fine quality, organic scum to begin with! Adding Further info with studies from MOLPADIA!! A study that further added some understanding to our knowledge of these gut communities comes from a recent paper by Teresa Amaro and others in Deep-Sea Research from 2009 (here to see it). 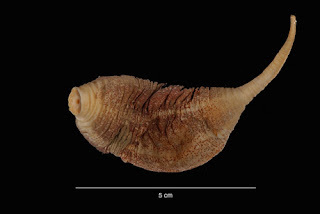 Their study focused on the North Atlantic deep-sea sea cucumber Molpadia musculus which is just a lovely animal that is basically a big mud-eating yam-shaped bag.. Yes, I've seen them alive, they are THAT glamorous. Sometimes they are purple. But perhaps what is most interesting was their study that compared two populations of Molpadia-each population present in a different canyon. Each canyon with a different nutritonal setting! How might these different food rich/poor settings affect the microbe fauna of each sea cucumber population?? The authors compared the bacterial communities present in a canyon with a sediment bottom that was rich in organic matter (i.e., food!) versus one which was poor in organic food. 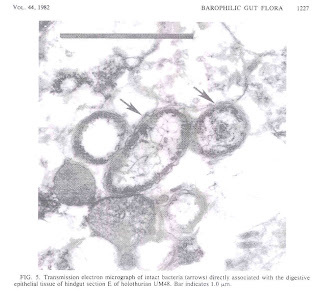 They found that in the canyon with a rich sediment bottom with lots of yummy organic food, the Molpadia did not need to develop a specialized community of gut bacteria! 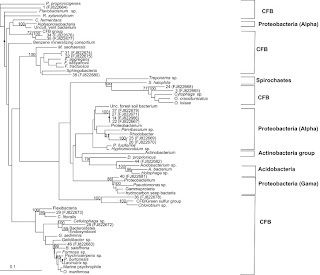 In contrast, the population of Molpadia present where the sediment was poorer DID have a more specialized community of bacteria.. Does this augment or provide further nutrients to the host cucumber? So-getting back to some of the questions asked earlier.. these bacterial communites seem to be an important part of how these weird critters live their lives- as they trundle around on the sea bottom picking up delicious scum from the abyssal mud of the sea bottoms! Perhaps they carry it with them or perhaps they are feeding on them? Many questions remain! Dude, this is awesome! Thanks for dredging up that cool video. Are these guys perhaps the deep-sea equivalent of earthworms, keeping the soil nice and loose and rich? I bet there are other organisms out there benefiting from the turnover, even if it's just different kinds of bacteria . . . 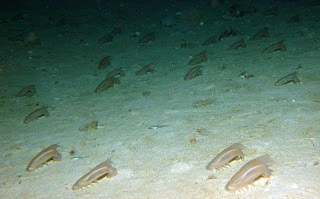 In the deeps-they are more like cows...feeding on the marine snow as it settles but also "carbon cycling" and so forth. They haven't plumbed the full depth of how important sea cucumbers are in the deeps..but given the incredible biomass I think its likely to be great.. This is really awesome! It's really fascinating. Cephalopod Awareness Days! Echinoblog Off Topic!